Are Pakistan And Iran Ignoring The Plight Of China’s Muslims? Home to 1.3 billion people, China, the world’s second-largest economy, has been facing a series of internal political schisms and jarring dissidence for decades. To count – Taiwan, Tibet, the Xinjiang conflict, though undermined, are giving tough times to the absolutist one-party communist government of China. The world is aware of the conflicts of China with Taiwan and Tibet, whereas Xinjiang remains an undiscussed and unheard-of conflict in world politics. Xinjiang province falls in the western part of the Republic of China, where the ethnic Uighur community shares a long history of discord with the Chinese authorities. Uighurs are predominantly Muslims and they see themselves as culturally and ethnically close to Central Asian nations. Back in the early 20th century, Uighurs declared independence in the form of an East Turkestan state. However, it only lasted for a while and the area was subsequently brought back under the control of communist China in 1949. 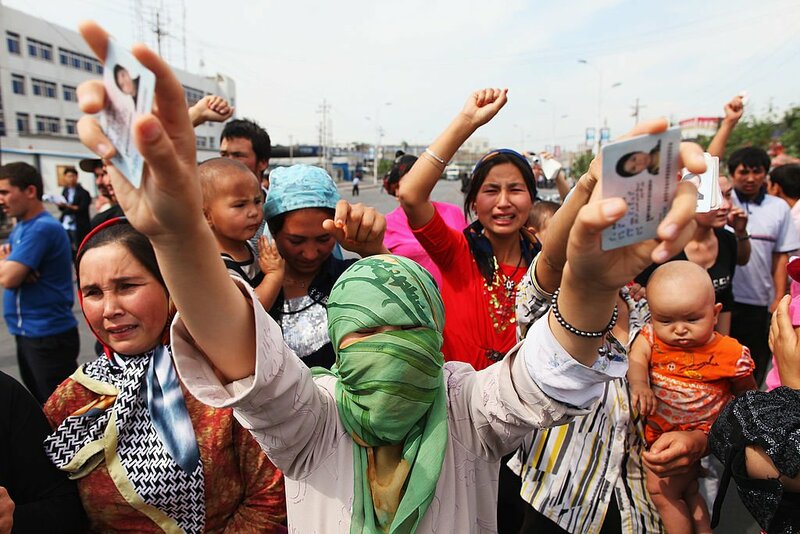 Similar to other conflict-ridden parts of the world, the indigenous population of Xinjiang province is ruthlessly suppressed and denied basic human rights. The oppressive tactics of the Chinese government include exploiting the abundant natural resources from the Xinjiang area. Despite being a reservoir of resources like natural gas, oil, coal, gold and other minerals, the living standard of Uighurs is one of the lowest in entire China. Massive migration has taken place, with the Han Chinese population in the region counterbalancing the ratio of the population of the ethnic Uighur community. In 1949, the Uighur population in the Xinjiang area was around 90%, which has been reduced to 45% at this time. Meanwhile, the Chinese population in the area grew from 6% in 1953 to 40% today. Forty-five nuclear devices were tested by the Chinese government in the Xinjiang province, between 1964 to 1966. It polluted the water, air, land and is a continuous threat to the local human population and livestock. The Uighur community finds it hard to openly practice their religious obligations and beliefs. At times, the working class Uighurs are banned from observing fast during Ramadan. The health of government employees is often cited as an official reason. There is a lack of freedom of religion to such an extent that it amounts to a ‘cultural genocide’. This grievous list of human rights violations by China should have been enough to bang the deaf ears of the world community, especially those who claim to be the defenders and protectors of Muslims. Why is that nobody is crying and beating their chests when everything is strikingly noticeable about the livelihood of Uighurs before the world? Why is no one passing resolutions against this enforced rule of China over Xinjiang province? Do the countries, who every now and then extend their sympathies to the poor condition of Muslims around the world, know about the miserable plight of Uighurs or do they just choose to remain silent as their national interests could be at stake? Pertinently, it is essential to discuss the role of two nations which are actively involved in defending the rights of Muslims, elsewhere. The leaders of Iran and Pakistan have repeatedly voiced their concern over the deplorable condition of Rohingya Muslims in Myanmar, Palestinians in Israel, and Kashmiri Muslims in India, whereas there is no reaction as far as the Xinjiang conflict is concerned. On the contrary, they sometimes support the human rights violations perpetrated by China against Uighur Muslims. In 2009, when hundreds of Uighurs Muslims were brutally shot dead by Chinese military and Han mobs, there was no backlash and criticism from Iranian and Pakistani officials. This hypocritical approach was not received well by some senior clerics in Iran. They lambasted the Iranian authorities and highlighted their conflictual stance. The stature of ‘guardians of Muslims’ advertised by Iran was questioned by these theologians. One of the clerics, Ayatollah Youssef Sanei, a reformist, said, “How could China suppress the Muslims so violently and seek good relations with Muslim countries, and sometimes dominate their markets?” He also questioned why Iran, which considered itself to be the worldwide defender of Muslims, could not criticise China when it was oppressing Muslims and said that Iran’s silence was because of its commercial, military and political connections with China. Additionally, Uighur residents questioned the double standards and the silence on the part of the Pakistani government towards Uighur Muslims. The deep relations of Pakistan and Iran with China is seemingly a single reason that these two countries are not mounting pressure on China with respect to the Xinjiang conflict. Iran, already destabilised by international sanctions, has developed strong ties with China in the fields of economy, military, political links, trade, oil and gas. And who could forget the importance of the Silk Road in connecting both the nations? China is in favour of restraining Iran’s nuclear capacity but criticises the sanctions placed on them, thereby indicating its soft stance towards the Iranian republic. Conclusively, China and Iran have entered into a ‘holy alliance’ where no one is ready to look at their darker sides. Similarly, Pakistan, which has indefinitely tried to pass resolutions against India in the United Nations for the liberation of Kashmir and is materially supporting the struggle, and has recently released financial aid for the Rohingya Muslims, has never condemned the deprivation and oppression of Uighur Muslims. Why would they? Why would they bother China when they have constructed the China-Pakistan Economic Corridor (CPEC) for them. Why would they revolt against the country which sides with them to counter Indian aggression? The bottom line is that if Pakistan and Iran were really concerned about the deplorable conditions of Muslims worldwide, then they would have outrightly denounced the reprehensible acts of China against Uighur Muslims. Unfortunately, they remain mute spectators when it comes to the Xinjiang conflict as national interest seems to take greater priority over religious affiliations. They pounce upon oppressive governments when there is no threat to their foreign policy. There is no challenging threat from India to these two countries, neither from Israel, nor from Mynanmar. That is why they behave like lions there while dragons beat them into silence.